This C7 z06 Corvette packed with 650HP and 650 LB-FT needs the best possible traction and light weight wheels to accommodate its performance. This Z06 is fully loaded with the Z07 performance package including the massive Carbon Ceramic rotors and Brembo brake calipers. The ZR-Spec will perfectly suit and handle the power under the Z06 hood. With its given nature the Project 6GR 10-TEN ZR-SPEC wheel weights are astonishing 24.35LB Front and 26.35LB ea rears. If you are looking to change the overall look of your Z06 Corvette while complementing its body style and saving weight the Project 6GR wheels would be the best choice. This is what we call the “perfect setup” on this Chevrolet Corvette sporting the Project 6GR 10-TEN in 19×10 Front & 20×12 rears wrapped with the Nitto Invos measuring 285/30/19 Front and 345/25/20 Rear . The Nitto Invo is an Ultra High Performance street tire that provides a blend performance of ride comfort and quality. The all new Spun Forged Project 6GR 10-TEN in Gloss black makes a perfect color combination and shows off those massive carbon ceramic brakes. 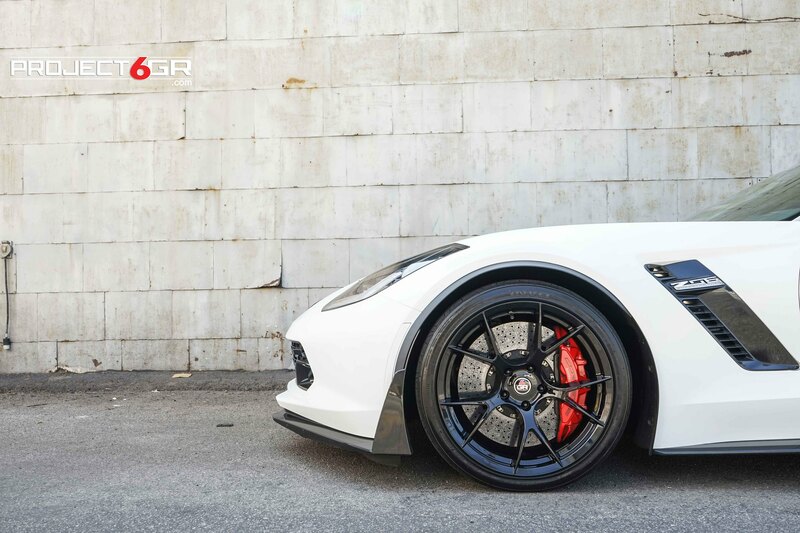 After spending countless hours in designing and engineered the perfect setup for the Z06 we are proud to mention the Project 6GR wheels offer direct fitment for the Chevy Corvette Z06 and Grandsport meaning you won’t be needing Hub rings or spacers. The Project 6GR wheels ZR-Spec have been specifically design to be Hub centric eliminating any vibrations while on the road. Look at the standard and custom wheels that we offer here on our website so you can find the ideal fit for your Corvette . If you need some help making the right choice or want some expert advice, you can give us a call at 888-714-7467, and a member of our team will be glad to help you find the perfect rims.